It was an autumn day in 2016, and Ellie Carter’s two young sons were playing with a soccer ball. “Hey, Mommy, come kick the ball with us,” her 3-year-old called. “Mommy can’t play with us,” her 5-year-old interjected. Ellie’s heart sank. This is not what I want my kids to remember, she thought to herself. I want to be able to chase them around, not constantly be tired or in pain. For most of her life, Ellie had been active. She played softball and ran track and cross-country in high school. After college, she worked out at the Gold’s Gym near her home in St. Louis. In 2010, Ellie got married, and she and her husband moved to Jacksonville, Florida. When she searched for a Gold’s Gym by her new home, she found that the closest one was 90 miles away. Without Gold’s Gym, she fell into a workout slump. A few years later, Ellie and her family moved back to Missouri. Between being a working mom and taking care of her two young sons, she had trouble making time to work out—until January 2016. Eager to prioritize exercise again, she signed up for the Gold’s Gym Challenge. By the time Gold’s Gym Challenge ended in April, she was back at her high school weight. That’s when life took a turn for the worse. Two weeks later, Ellie’s father was diagnosed with leukemia. As she coped with the stress of her dad’s illness, her own health issues surfaced. She was diagnosed with endometriosis and had a hysterectomy. After the surgery, she was on several medications and in constant pain. In January 2017, her father passed away. That, she realized, was the kind of parent she wanted to be to her own sons. She mustered the strength to return to Gold’s Gym. With a friend’s encouragement, Ellie signed up for a second time for the Gold’s Gym Challenge in 2017 and attended many group fitness classes like BODYPUMP and BODYCOMBAT. On cardio days, she switched among cycling, elliptical training and the classes; on weightlifting days, she alternated between biceps and back or triceps and chest. She also began monitoring her diet, eating more salads and lean meats, doing weekly meal prep and using MyFitnessPal. Her sons, who often accompanied her to the gym, noticed the change. “Every time we’d go to Gold’s the boys would say, ‘We’re going to the gym, and Mommy is going to get strong,’” she says. Ellie placed 4th place in her age group nationally in the Gold’s Gym Challenge. By the end of the Challenge, she’d dropped 18 pounds and cut her percentage of body fat by 5.4 percent. She recently ran her first half-marathon in seven years—something, she says, she couldn’t have done without Gold’s Gym. 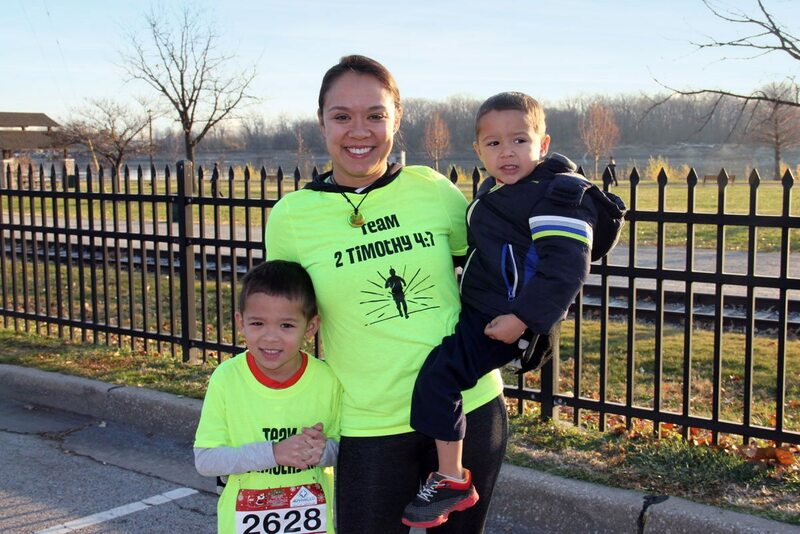 Ellie Carter, who now looks for ways to include her children in her workouts, ran a .3-mile race with her 5-year-old son. She’s also found ways to include her kids in her workouts—sometimes she’ll bicep curl them; other times, they’ll bike with her while she runs. She and her 5-year-old plan to run a race together soon.